p.39 [continued] THE HIGH TOR. that fling their broad leafy boles over its sparkling waters, subduing the dazzling brilliance with their sombre shade; at times it becomes impetuous and even turbulent, as, wasting its strength in whitened foam, it dashes over the rocky fragments that impede its course; then again it subsides into a rippling current, and carols merrily, like a talkative companion, by the side of the wayfarer." The upper portion of the High Tor, for more than one hundred and fifty feet, presents one vast mass of naked perpendicular rock, indented with rents and fissures, from between which peep out tufts of grass, and shrubs, and flowers, with here and there a few stunted trees, that seem to have sprung spontaneously from the openings. Seen in all aspects, the High Tor is grand and impressive, but in the glimmer of the broad moonlight it is unspeakably beautiful and picturesque. Opposite to this majestic rock, the river is spanned by a little wooden bridge, which leads to the HIGH TOR GROTTO. The roof and sides of this really natural excavation are encrusted with a profusion of crystallizations of calcareous spar, chiefly of the scalon dodecahedron and double pyramid or dog-tooth shape. When lighted up by the guide, the effect of these natural crystals, glittering like rarest gems, is peculiarly brilliant. There is no cave which can be examined with more ease and comfort, and there is none, which from the splendour of its minerals, and the character of its construction, can be inspected with greater interest and satisfaction. Near the extremity, the path gently descends, the roof becomes lower, and a clear pool of water is reached, beyond which the rocks close in, and further progress is obstructed. The tunnel of the railway passes through the High Tor, and the effect of the rolling of the train, as heard in this grotto, resembles the rumbling reverberations of distant thunder. 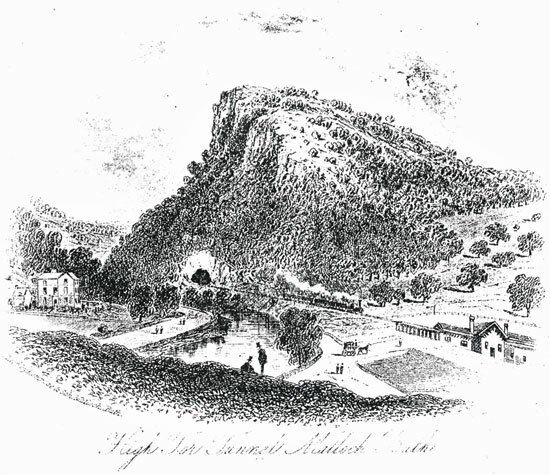 The grounds of the High Tor have been latterly enclosed and laid out for public walks; so that the summit of the stately rock is now approachable with great ease and enjoyment. The approach is reached by crossing the railway bridge, turning to the left, and then passing under the line on the right, when the Entrance Lodge will be seen to the left of the roadway. Before leaving Matlock, however, we must not omit to mention, for the information of inquiring archaeologists, who are desirous of tracing the footsteps of the ancient invaders of Britain, that some vestiges of their settlements have been found in this locality. TI. CL, TR. LVT. BR. EX. ARG. IMP. CAES. HADRIANJ. AUG. MET. LVT. L. ARVCONI. VERCVND. MEAL. LVTVD. ventione, and which there is great reason to suppose was the present town of Chesterfield. This last-mentioned example of Roman antiquity was presented by Mrs. Adam Wolley to the British Museum, where that found on Cromford Moor is also deposited. Resuming our railway route, we pass from Matlock-Bath Station, through the High Tor Tunnel, cut in the solid rock; emerging from which, the scenery is exceedingly pretty and diversified, although cut up, as it were, by natural effects, into a series of miniature landscapes. 'Bemroses' Guide to Matlock, Bakewell, Chatsworth, Haddon Hall, &c' by John Hicklin, Third Edition, pub Bemrose and Sons, London (no date, but about 1869). Reproduced here with the very kind permission and help of Sonia Addis Smith, whose book this is from. OCRed and images scanned by Ann Andrews, 2001 - 2004.